A herd of cattle at a dusty watering hole in the Sahel. The photo indicates the region’s delicate balance of natural resources and water requirements. Photo courtesy of Manfred Schweda. Enlarge Image. Results: Increased agricultural activity is a rain taker, not a rain maker, according to researchers at Pacific Northwest National Laboratory and their collaborators at the University of California Los Angeles and the University of Texas. 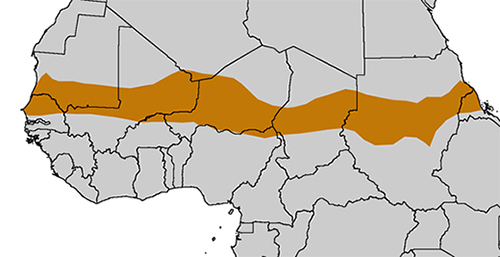 They fed observed land-use change data in a climate model and found the expansion of agriculture in the African Sahel region decreases summer rainfall through its impact on monsoon rains. 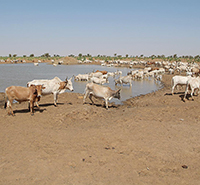 The simulated decrease in summer rainfall reaches 10 percent over the Sahel, a region that is already stressed by water needs for human and ecological use. Their study offers new insight on how land-use change may affect regional rainfall. Why It Matters: A fast-growing world population needs to fill dinner plates, heat homes and clear land for housing. To feed this demand, forests fall and land is turned to pasture showing a clear human impact on land use around the world. The extent and type of land-use change also has measurable effects on the climate. Africa's Sahel region heavily depends on monsoon rainfall (see sidebar: Monsoon) to sustain crops, provide fresh water and keep the land stable. Growth like that seen in the Sahel, where the population is doubling every 20 years, can provide valuable information on how land use and climate interconnect. This modeling study is designed to show the land use, precipitation and climate connections, offering insight for global land and water management and future climate change. The Sahel region spans the African continent, from the Atlantic Ocean in the west to the Red Sea in the east. This narrow swath of semi-arid land supports mostly grassland and forest/grassland mixture, and lies as an ecosystem transition zone between the Sahara Desert to the north, and more tropical grasslands to the south. The low annual precipitation indicates the region is strongly reliant on the monsoon for water supply. Methods: Researchers at PNNL and their collaborators examined the range of model simulation responses of the African Monsoon system and Sahel precipitation due to land-use and land-cover change. Using satellite measurements of land cover and estimates of land-cover change based on historical data, the researchers designed their experiments to use the Weather Research and Forecasting model (WRF) and run 16 simulations with different combinations of land surface and cloud models, representing key processes linking land use/land cover to regional climate. They further explored the relationship between the model responses to land-use/land-cover change and the monsoon conditions resulting from rainfall and surface moisture in the control simulations. The findings show a detrimental impact on the amount of summer rainfall via the effects on the African monsoon circulation. However, the results were sensitive to the land surface model used. Simulations that had a dry and wet bias in surface moisture showed a relatively weak response, due to moisture and energy limits respectively. On the other hand, simulations with realistic climatology compared to observations showed up to a 10 percent decrease in summer rainfall over the region. The study highlights the need for more extensive measurements of surface energy fluxes to evaluate models and provide accurate projections of the effects of land-use and land changes on rainfall. What's Next? The researchers will extend their study to investigate how climate change, besides land-use change, may influence precipitation and water cycle extremes such as floods and droughts. Sponsors: The research was supported by the U.S. Department of Energy Biological and Environmental Research as part of the Regional and Global Climate Modeling program and Earth System Modeling programs. Computing resources for the simulations are provided by the National Energy Research Scientific Computing Center (NERSC) and Oak Ridge Leadership Computing Facility (OLCF). A monsoon is more than rain, involving changes in wind, atmospheric pressure and precipitation. It is sensitive to the seasonal balance of heat from nearby oceans and heat given off from the land. Many dry regions of the world rely on annual rainfall from monsoons for the success of crops, energy production and sustainable living for humans and animals. Small changes in monsoons can have a large impact on these conditions by prolonging droughts or fostering floods. Monsoons also affect the global circulation thus spreading their influence world-wide.